The Brandenburg Stone shows a single Comet is responsible for the Biblical Flood, the Dardanus Flood, the Calamity of Caesar’s Comet, and the Catastrophe of 536/540 AD. This historical Comet has a periodicity of 575 years, as confirmed by Sir Isaac Newton in the 17th Century. Around the future dates of 2256 and 2831 in the present Third Millennium Comet Catastrophes may be expected with hundreds of millions of casualties on Earth. The Brandenburg Stone from Kentucky, USA, bears a petroglyph (Fig.1), which deals with the most important Comet in human history.1-3 It is a so-called long-periodical Comet, having a periodicity of about 575 years. It has a head and a long tail, both consisting of rocks and ice. It appears, there is also cometary debris behind the whole object, because some of the Catastrophes started several years after the appearance of the Comet. It is a so-called Sun-grazer, and the cometary debris is probably the result of this particular feature.4,5 Parts of the Comet have fallen apart after previous passages close to the Sun. The petroglyph provides an excellent description of the Comet Catastrophe of 536/540 AD.3 Two rocky parts of the Swarm reached the Earth after the appearance of the Comet in 531 AD. The consequences were devastating. It became a worldwide Catastrophe. The atmosphere changed into a dust veil. It resembled a huge volcano catastrophe. 2.9 million people perished within a time period of about nine years, which was 5.5% of the world population. The consequences were felt during a time period of about a century after it. Famine, and dry and cold weather, were the main features. The carving is dated to 560 AD. However, the same Comet was also responsible for previous Catastrophes. The carving is a large Arrow, and in a geographical sense the start of it coincides with a location at the East Coast of the US, at about 40°N, which is near the present city of Philadelphia.3,6-11 This coast was reached for the first time in the Fifth Dynasty of Egypt, just before the Biblical Flood. The date of this Flood is accurately known, c.2344 BC (tree-ring dating, uncertainty of 5 years). The mentioned periodicity shows the Disaster was caused by this Comet, in 531-(5x575)= c.2344 BC. The consequences were devastating, again. The Flood lasted 60+60= 120 days, and in total the precipitation was about 9 meters of water. 2.6 million people on Earth perished, which was 54% of the world population.8-11 It was, and still is, the most powerful Catastrophe in human history. The twelve Henbury Impact Craters, 150 km southwest of Alice Springs, Northern Territory, Australia, have a similar date.12 It resulted in the end of the Old Kingdom of Egypt, and all other ancient civilizations on Earth. Long lasting famine, and dry and cold weather, were the main features, again. 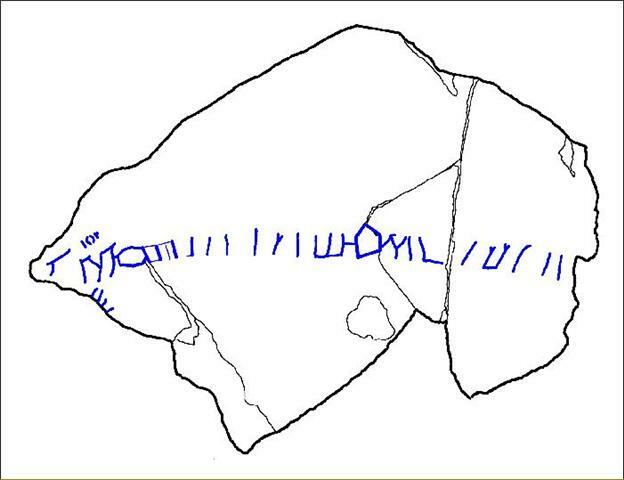 The Brandenburg Stone strongly suggests, that the same Comet Swarm was also responsible for the Dardanus Flood of 1159 BC, 35 years after the appearance of the Comet in 531-(3x575)= 1194 BC.3 The Coelbren text of twenty letters refers to the Twentieth Dynasty when it happened. This Flood lasted 40+40= 80 days, and in total the precipitation was about 5.5 meters of water. 3.8 million people on Earth perished, which was 21% of the world population. Subsequently, 2.0 million people died because of system collapse (lack of government), which was 11% of the original world population. So, in total 3.8+2.0= 5.8 million people died (21+11= 32%). The Catastrophe ended the New Kingdom of Egypt, and almost all other ancient civilizations on Earth. Famine, and dry and cold weather, were the main features, again. It was the cause of the chaos during the Third Intermediate Period (TIP), which lasted for almost four centuries. It was the worst Catastrophe in human history. Descriptions of this Catastrophe are very rare. The Brandenburg Stone is an exception. The Catastrophe coincided with the end of the international Copper and Tin trade in the Bronze Age.13,14 It marked the start of the Iron Age. The Stone shows, that the same Swarm caused the Calamity known as Caesar’s Comet, two months after the appearance of the main object, in 531-575= 44 BC.3 This time there was no Flood but only a dust veil, which caused 0.5 million casualties, about 1.3% of the world population. It strongly resembled a volcano catastrophe. Famine and dry weather lasted for 15 years. It ended the Ptolemaic Dynasty, and it was the beginning of the time period of the Roman Emperors. The Catastrophe marked the start of the Christian Era, in which we are presently living. It appears, the Brandenburg Stone does not indicate any calamity before the Biblical Flood, but the periodicity of the Comet suggests a Catastrophe at 531-(6x575)= 2919 BC. This date coincides with the last years of the First Dynasty of Egypt, and it is very probable that it caused its abrupt end. Tree-ring data and ice core research confirm a major event around this date,15,16 and the unstable Second Dynasty suggests chaos in this early time period in human history. It was the reason that most of the time Egypt was not united during this Dynasty. The Comet appeared again in 531-(4x575)= 1769 BC, which is c.24 years after what appears to be the best date of the end of the Twelfth Dynasty of the Middle Kingdom, c.1793 BC. The reason for the end of the Middle Kingdom is presently unknown, but it is highly probable this Comet was involved. It was the start of the Second Intermediate Period (SIP), which lasted two centuries, until the start of the Eighteenth Dynasty (New Kingdom), c.1580 BC. It was a time period of political chaos, again, as generally accepted by Egyptologists. The Comet also appeared in 531-(2x575)= 619 BC. Literature sources report a huge Comet in the sky, larger than previously seen for several centuries.17 It appears, that for the first time people on Earth were rather lucky. A cosmic collision with the tail of the Comet, or with debris from this object, did not occur. The nine Kaali Impact Craters on the island of Saarema, Estonia, have a similar date.18 During the early Iron Age a stone wall of half a kilometer length was built around the lake inside the main crater. The date of the Comet is indicated by tree-ring minima. As predicted by the Brandenburg Stone a huge Comet appeared in the later year of 531+575= 1106 AD! After perihelion the Sun-grazer broke into two fragments, but the Swarm did not cause a major Catastrophe.4,5 As predicted by the Stone the same Comet appeared again in the later year of 531+(2x575)= 1680 AD! The Comet was “discovered” by the German astronomer Gottfried Kirch (1639-1710). For that reason it is now called Kirch’s Comet.4,5 He also invented and charted the now obsolete star constellation called the Brandenburg Scepter. The name of the town of Brandenburg, Kentucky, USA, is related to it. The danger of a worldwide Comet Catastrophe is highly underestimated. At the moment the Western Civilization based in Europe and North America is the leading power in the World. A Cosmic Collision with a Comet is capable to wipe out this power, together with other civilizations, within a single year. The Christian Church is the head of spirituality. A Comet might destroy its basis, together with other important religions, within a few months. Chaos might rule the World for centuries. It happened several times before! Research on worldwide Catastrophes was only done on a limited scale during the last decade.27-35 Archaeologists and historians are not aware of the existence of these events. They only know about local volcanic catastrophes, but for instance Mike Baillie had, and still has, the greatest difficulty to show that Comets are much more dangerous.15,29 Most of these ‘scientists’ do not even know about the presence of comets and asteroids. They often do not know the meaning of these words. The website of Barry Warmkessel is the only place on the internet which discusses the subject in a serious manner.11 It shows the low status of this subject in the present year of 2010. The Great Comet of 1680/1 did not cause an official Catastrophe. However, the date clearly shows up in tree-ring measurements and ice core research.15,16,36,37 These signals are usually explained in terms of eruptions of one or more (local) volcano’s. These explanations are definitely wrong. This Sun-grazer left a lot of debris in the solar system, which caused, together with other comets around this date, a global downturn of the climate on Earth. As a rule the influence of a Comet is at least an order of magnitude bigger than that of a volcano (10 to 100 times). It is a recent example of a Comet Catastrophe, which is simply not described in the literature. The number of casualties is not even mentioned! The Brandenburg Stone predicted possible Comet Catastrophes in 531+575= 1106, and in 531 +2x575= 1681. These predictions turned out to be correct. The Stone also predicts possible Comet Catastrophes in 531+3x575= 2256, and in 531+4x575= 2831. Huge Catastrophes might occur around these future dates in the Third Millennium, in which we are presently living. Sir Isaac Newton, one of the greatest scientists who ever lived on this Planet, supported these conclusions.20,23 It is clear, that the English government and the Church in the 17th Century supported this view, too. The German astronomer Johann Encke (1791-1865) calculated the periodicity of the Great Comet of 1680/1, and found a value of 9,356 years, in stead of circa 575 years.4,5,38,39 It appears, that his calculation has an official status within the astronomical world. In view of the importance of the subject, I suggest to repeat this calculation, and to consider the possibility that an accuracy of four figures in the answer might not be justified, in view of the low level of accuracy of the observed data from that time period. The possibility that the whole calculation cannot be justified should also be considered. These observations have been performed (often by illiterate amateurs without a telescope) around a huge, bright Comet in a possibly cloudy sky during a winter at the end of the 17th Century. The possibility of political manupulation of official data must also be considered. In general, governments do not like panicky reactions from the academical world, which challenge the authority of the Head of State. 3. De Jonge, R.M., “The Brandenburg Stone, Comet Catastrophe of 536/540 AD (560 AD, Battletown, Meade County, Kentucky)”, Ref.8, to be published. 7. De Jonge, R.M., “The Discovery of Three Continents (Santo Stefano, North Sardinia, Italy, c.2300 BC)”, Ancient American, Vol.12, No.76, pgs.28-29 (2007), Ref.8. 9. De Jonge, R.M., “Discovery of America and the Flood (c.2300 BC, Ita Letra, Villarrica, Paraguay)”, Ref.8, to be published. 10. De Jonge, R.M., “The Discovery of Australia and the Flood (The Rainbow Serpent Shelter, Mt. Borradaile, Arnhem Land)”, Ref.8, to be published. 14. Bailey, J., Sailing to Paradise, Simon & Schuster, 1994 (ISBN 0-684-81297-5). 15. Baillie, M.G.L., Exodus to Arthur, Catastrophic Encounters with Comets, BT Batsford Ltd., London, 1999 (ISBN 0-7134-8681-3). 16. Salzer, M.W., and Hughes, M.K., Quaternary Research 67, 57-68, 2007. 20. Newton, I., Philosophiae Naturalis Principia Mathematica, third ed., 1726, Book III, Proposition XLI, Problem XXI. 22. Ramsey, J.T., and Lewis Licht, A., The comet of 44 B.C. and Caesar's funeral games, The American Philological Association (1997). 25. Whiston, W., New Theory of the Earth (1696). 27. Peiser, B.J., Palmer, T., Bailey, M.E., Natural Catastrophes during Bronze Age Civilizations, BAR International Series 728, Oxford, 1998 (ISBN 0-86054-916-X). 28. Peiser, B.J., “Evidence for a Global Disaster in the Late 3rd Millennium BC”, Ref.27, pgs. 117-140. 29. Baillie, M.G.L., “Hints that Cometary Debris played some Role in several Tree-Ring Dated Environmental Downturns in the Bronze Age”, Ref.27, pgs.109-117. 30. Courty, M.A., “The Soil Record of an Exceptional Event at 4000 BP in the Middle East”, Ref.27, pgs.93-109. 31. Clube, S.V.M., and Napier, W.M., The Cosmic Serpent, Faber and Faber, London, 1982. 32. Clube, S.V.M., and Napier, W.M., The Cosmic Winter, Blackwell, Oxford, 1990. 33. Joseph, F., Survivors of Atlantis, Their Impact on World Culture, Bear & Co., Vermont 2004 (ISBN 1-59143-0-040-2). 34. Grondine, E.P., Man and Impact in the Americas, Kempton, Illinois (2005) (ISBN 0-9776 -152-0-0). 35. Bruce Masse, W., Earth, Air, Fire, and Water, The Archaeology of Bronze Age Cosmic Catastrophes, Ref.27, pgs.53-92. 36. Baillie, M.G.L., A Slice Through Time: Dendrochronology and Precision Dating, Routledge, London (1996) (ISBN 0-713-47654-0). 37. Baillie, M.G.L., New Light on the Black Death: The Cosmic Connection, Ed. Tempus (2006).